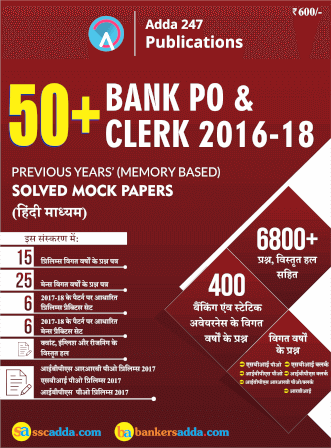 Bank PO & Clerk Previous Years Papers: BOOK Now!! Aiming for Banking sector Recruitments 2018? Then practicing with previous years' papers can help you to get an idea of the difficulty level and types of questions asked in various Bank PO and Clerk exams. 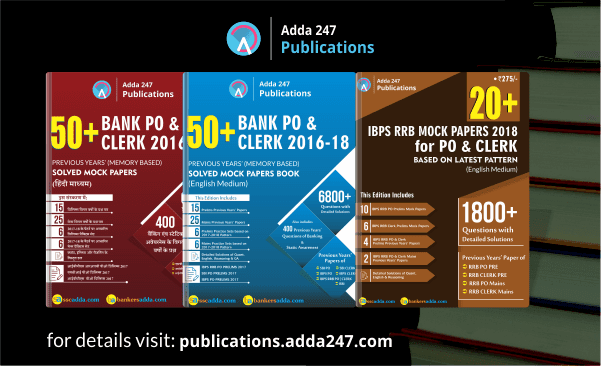 Adda247 brings to you SOLVED MOCK PAPERS BOOK of 50 Bank PO & Clerk 2016-18 Previous Years' memory based papers in English and Hindi Medium, both and IBPS RRB Mock Papers 2018 for PO & Clerk Book in English Medium. Adda247's Printed Edition Book of 50 Bank PO & Clerk 2016-18 Previous Years' Papers is available only in English Medium for Pre Booking for Rs. 399. You can PRE BOOK it NOW and the delivery will start from 1st week of April. In this book, you will get Solved Papers of all major Banking sector recruitment exams like SBI PO, SBI Clerk, IBPS PO, IBPS Clerk, IBPS RRB PO and IBPS RRB Clerk. Solve more than 6800 questions and practice till perfection!! You will also get 400+ previous years' questions of Banking and Static Awareness in this book to help you prepare the General Awareness section which will be definitely there in almost every Bank PO and Clerk recruitment exam. 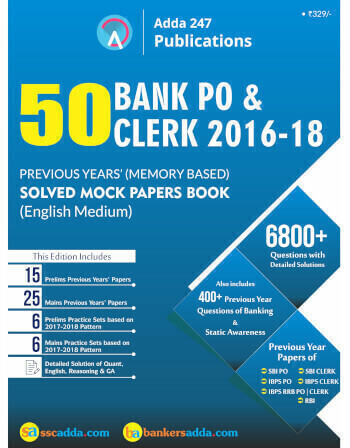 The book is available in English and Hindi Medium and consists of more than 6800 questions covering all the major Bank PO and Clerk Memory Based Previous years' papers including the practice sets for Prelims and Mains of Banking examinations. There are new methods and approach to solve the latest pattern questions within a short time limit. Detailed solutions are provided to every question for a better conceptual learning. The questions are duly framed and prepared by our best faculties in this field based on reviews given by aspirants who appeared for various bank PO and Clerk exams from 2016 to 2018. For the thorough preparation of banking and static awareness 400+ previous years' questions of banking and static awareness are also included in this book. While preparing, all the necessary including minute details have been taken into consideration. IBPS RRB Mock Papers 2018 for PO & Clerk Book incorporates as many as 20 practice sets IBPS RRB PO and IBPS RRB Clerk Prelims and 2 memory based papers of Mains. The papers are prepared under the tactical guidance of expert faculties at Adda247 to provide you with the best practice material possible. Practicing with mock papers is very important as it helps in familiarizing the aspirants with the pattern of the exam. It all helps them to ascertain how much time they spend on an average in solving a particular question and avoid situations where the bottom falls out of all their strategies when they get stuck pondering over a single low-scoring question for too long and thereby overlooking other high-scoring questions.